When you're a respected detective like Sherlock Holmes , your opinion carries a certain degree of weight. If you're going to accuse someone of foul play, you'd better be right. Because if you're not, somebody is probably going to suffer for it. 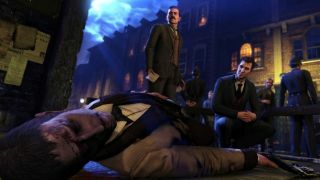 Crimes and Punishments , Focus Home Interactive's new Sherlock Holmes games, promises rather more serious consequences for getting it wrong, as its new E3 trailer shows. One of my biggest complaints about an investigative adventure game I recently played (that shall go unnamed) is that my investigations were essentially a waste of time. If I came to the wrong conclusion in this matter or that, I was told to simply try again, over and over, until I got it right. Success is always desirable, but success without the risk of failure really isn't much fun at all. The game will offer six cases, each with a number of potential suspects that will have to be winnowed down to the guilty party through analysis and deduction. But a misplaced accusation could bring with it "disastrous repercussions!" This trailer is supposed to be a demonstration of those "disastrous repercussions" but it's hard to figure out what exactly is happening. Sherlock seems bummed about not solving the case, but is it because the woman got away with murder? Or did his failure to prove that the guy in the hat actually committed the murder force the woman to pursue the only course of justice she had left—vengeance—and thereby perpetuate the cycle of violence and retribution that continues to plague our society to this very day? Because as repercussions go, that would be pretty disastrous. Hey, what am I, Sherlock Holmes? Play it for yourself if you're so curious. Crimes and Punishments comes out in September.